Destruction is seen around the Udai hospital following airstrikes on the town of Saraqeb in Syria's northwestern province of Idlib, Jan. 29, 2018. 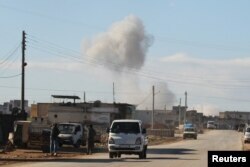 Syrian troops had been advancing on Idlib as part of a fierce offensive launched in late December with Russian backing. Nearly 200 civilians have reportedly been killed in Syrian government airstrikes launched in the past 37 days as part an offensive to retake territory in the northwest province of Idlib, the last province in the war-torn country remaining in the hands of insurgents battling to topple President Bashar al-Assad. The Syrian Observatory for Human Rights, a Britain-based organization that relies on information gathered by on-the-ground spotters, say among the dead are 50 children and 36 women and that civilian facilities are clearly being targeted, including makeshift clinics and market places. Smoke rises in a site hit by what activists said were airstrikes carried out by the Russian air force in the town of Saraqeb, in Idlib province, Syria, Jan. 9, 2016. Political activists say they have recorded more than 96 air raids, some involving the dropping of crude, but powerful barrel bombs, in the southern and eastern countryside of Idlib. Government helicopters dropped barrel bombs Wednesday on the villages of Tell-es-Sultan and Barissa, say activists. And the local council in Saraqeb reported the town has suffered “massive destruction resulting from the relentless bombing campaign by the Assad regime and Russian warplanes.” The council said most of Saraqeb’s main civilian facilities, including medical centers and bakeries, have been destroyed. The weeks-long government offensive has forced tens of thousands of civilians to flee towards the border with Turkey, according to humanitarian groups, but they are having to contend not only with harsh winter weather, but also to dodge fighting on an increasingly complex battlefield featuring forces loyal to the Assad regime, including foreign Shi’ite fighters, and a mixed bag of rebel militias, including al-Qaida-linked Tahrir al-Sham, working alongside Turkey. A soldier waves a Turkish flag as Turkish troops secure Bursayah hill, which separates the Kurdish-held enclave of Afrin from the Turkey-controlled town of Azaz, Syria, Jan. 28, 2018. To the north, a Turkish incursion launched more than a week ago, and backed by Syrian rebel militias, into the Kurdish enclave of Afrin, is complicating where refugees can go to seek safety. The Turkish intervention has prompted fierce fighting with much of the focus on a strategic hill near Azaz that has changed hands, reportedly, several times since January 22 between the Turkish military and Kurdish militiamen. Turkish Army tanks are seen near the Turkish-Syrian border in Kilis province, Turkey Jan. 31, 2018. To add to the complexity, Turkey sent a detachment of more than 40 armored vehicles into Idlib province Monday, apparently to re-enforce a de-escalation zone agreed to months ago by Turkey, Russia and Iran. Another Turkish convoy in Idlib was the target of a car bombing Tuesday that killed a Turkish civilian support worker, according to Turkey’s General Staff. It remains unclear who was responsible for the bomb. Initially Turkish officials blamed jihadists, but then later accused the Kurdish militia, the People’s Protection Units (YPG), of being behind the blast. On the face of it, the northwestern battlefield looks chaotic. But analysts, and Syrian rebel commanders, say there’s increasingly a logic to it, one driven by Ankara and Moscow, who appear to be maneuvering for the south and east of Idlib to end up back in the hands of the Assad regime, while the northern part of the province, as well as northern Aleppo, coming under the control of the Turks. “The operation poses serious dilemmas for Turkey,” says Gonul Tol, an analyst with the Middle East Institute, a Washington-based policy research organization. “Turkish officials said the aim of the operation was to create a 19-mile [30 km.] deep zone inside Syria, which can be used as a safe area for civilians. 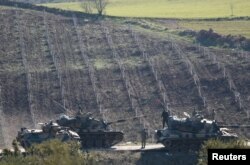 The zone is likely to be secured and administered by Turkey’s Syrian rebel allies,” she argued. But aside from the challenge the Turks face in defeating the Kurds in their enclave of Afrin, the question remains how rebel militiamen will react in the longer term. 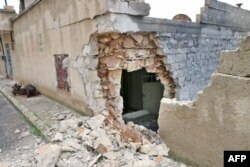 A picture taken on January 26, 2018, shows a damaged house in the Syrian town of Rajo in the Afrin District, Jan. 26, 2018. Many rebels say they will continue to mount an underground insurgency that will likely turn to car bombings and urban terrorism, pushing militiamen further away from the original democratic aims of the revolution. The longer term aims of al- Qaida affiliate Tahrir al-Sham will also be key.